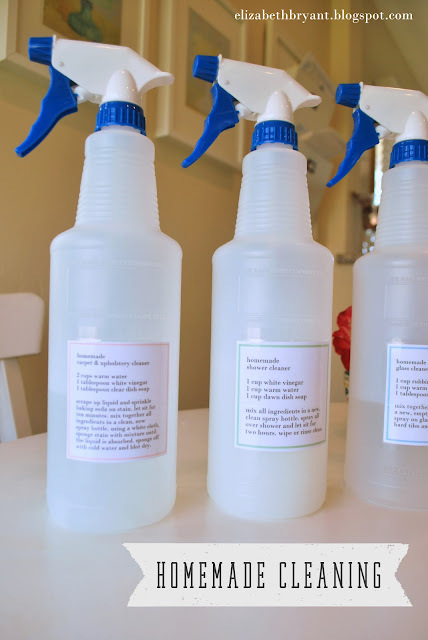 In an effort to use less chemicals around my house (and to save a few bucks) I decided to make my own household cleaner. 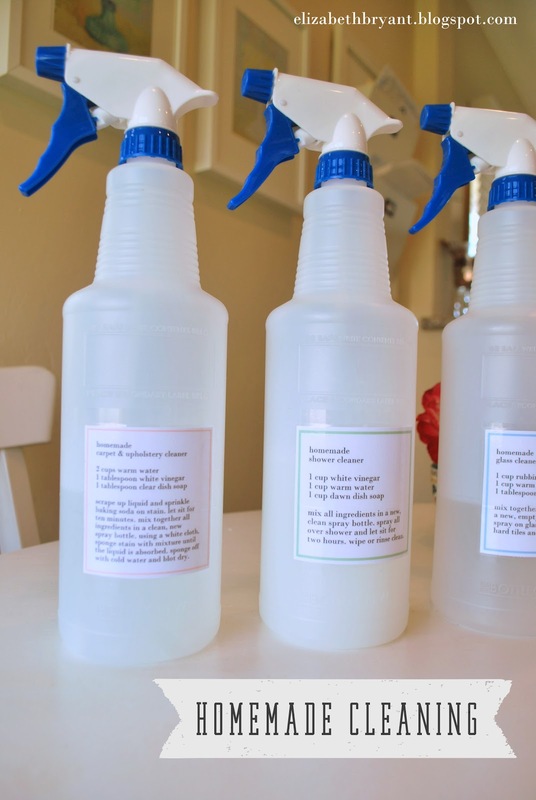 The #1 pin on my blog is the "magical carpet cleaner" post and it seriously works! 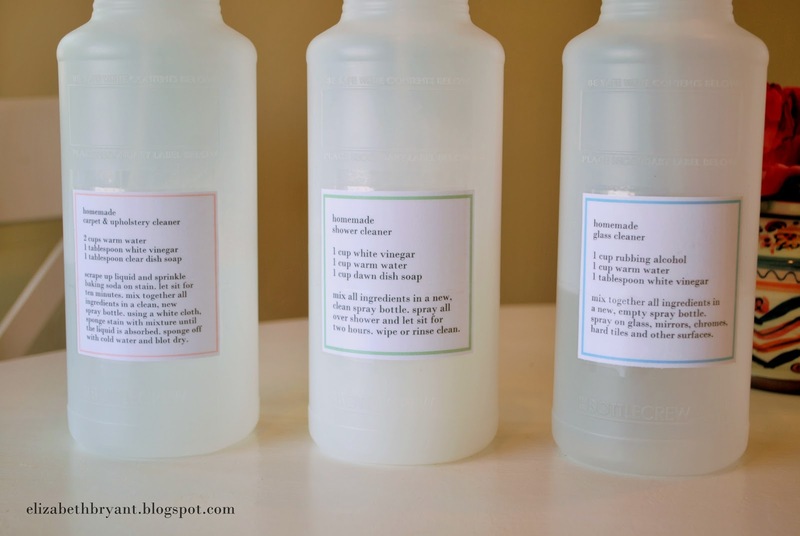 And now I'm obsessed with a few other cleaners that I've found. They're not "all natural" because they have dish soap and I'm sure there's some funky stuff in there but it sure is cheaper than buying bottle after bottle of cleaning supplies. I just printed these simple cards out and then taped them onto spray bottles I got at WalMart (if you're like me and don't have a laminator but want the look, then just use clear packing tape and carefully lay it on top). 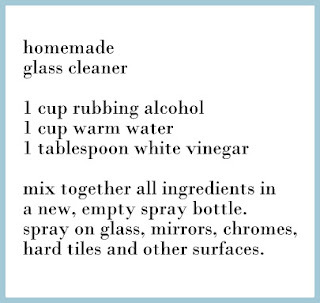 Mix all ingredients together in a clean spray bottle. Spray all over shower and let sit for two hours. Wipe or rinse clean. 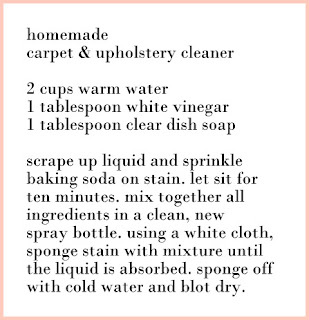 Scrape up liquid and sprinkle baking soda on stain. Let sit for 10 minutes. 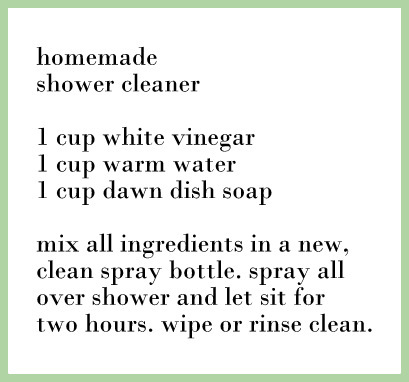 Mix together all ingredients in a clean, new spray bottle. 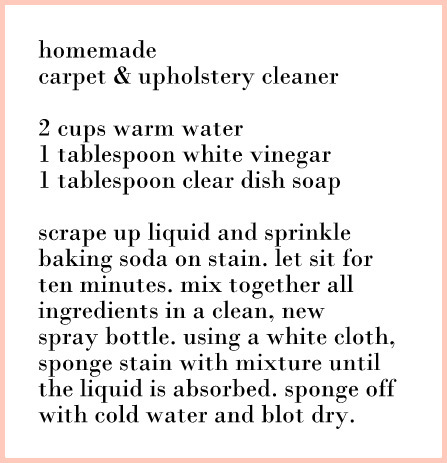 Using a white cloth, sponge stain with mixture until the liquid is absorbed. Sponge off with cold water and blot dry. 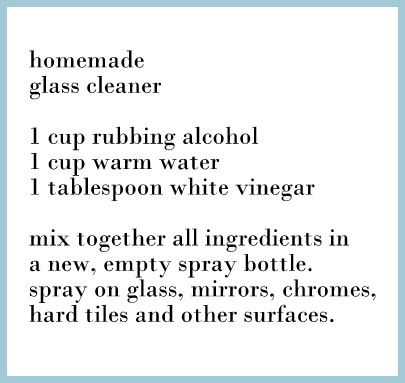 Mix all ingredients together in a new, empty spray bottle. Spray on glass, mirrors, chromes, hard tiles and other surfaces. * The first time I used this and wiped the mirror, I was sure it wasn't working - it just seemed to smear! But let it dry, it works and doesn't streak! Thanks for the cleaning supply recipes! I have a great dish soap I'll sub from Biokleen--there are lots of chemical free dishsoaps out there. Walmart carries the Seventh Generation which I also really like! Thanks Noni! I'm going to try it! I also wonder if Dr. Bronner's would work? Those look so easy! I will have to try them.